Located a mere one hour drive from Melbourne, the Yarra Valley region serves as a great option for a short but sweet escape from the hustle and bustle of the city. There's the fresh country air, stunning natural surroundings and plenty of wining and dining options, what's not to love? During our most recent trip to the region, we made sure to hit up a few wineries, ending with a cheesy date at the beautiful Yering Station. 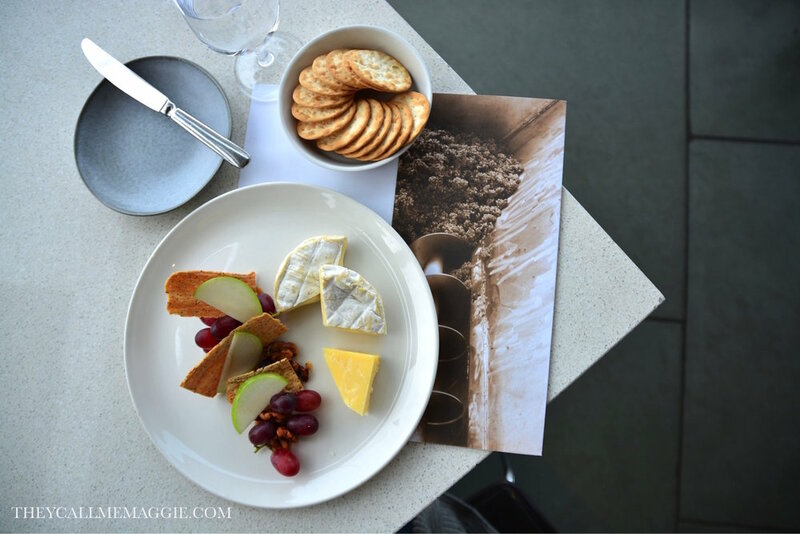 The cheese platter comprises a Yarra Valley Dairy camembert, Tarago River Gippsland blue and cloth bound farmhouse cheddar. If you're picky with your cheeses, you can switch the cheeses out; our dislike of blue cheese (blasphemous, I know) saw us with two servings of camembert. The camembert was sensationally rich and creamy as evident by its oozy interior which spilled out at the slightest pressure. But to our surprise, it was the deliciously punchy flavour of the cheddar that won our taste buds over and over again with every bite. Different combinations of the accompanying raisin jelly, red grapes, slices of apple, candied walnut and lavosh crackers brought out different characteristics of the cheeses.